They all deserve it, right? 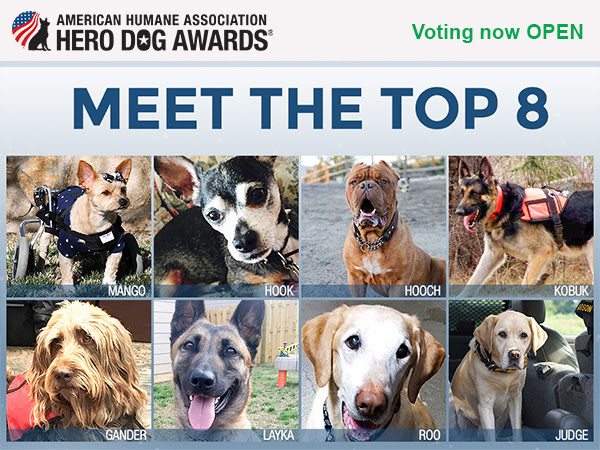 You can vote now through Aug. 24 for your favorite pup to win the grand prize in the 2016 American Humane Association (AHA) Hero Dog Awards, presented by the Lois Pope LIFE Foundation. That’s for sure. Over the past five years, millions of votes have been cast for nearly a thousand dogs competing for the award. The program reaches more than 1 billion people each year. You can vote online once every day for your favorite finalist until noon Pacific Time on Aug. 24, as long as you’re a U.S. citizen and at least 18 years old. The Hero Dog Awards ceremony will be held in Los Angeles on Sept. 10. The 2016 grand prize winner will be announced during the ceremony, which will be dedicated to Harley, the winner of the 2015 Hero Dog Award. Harley, a 15-year-old Chihuahua who spent the first 10 years of his life in a puppy-mill cage before becoming a “spokesdog” against these cruel facilities, died in March. To help hero dogs everywhere, AHA will donate $2,500 to each finalist’s charity partner, and an additional $5,000 to the grand prize winner’s charity partner. Founded in 1877, AHA was the first national humane organization in the U.S. and is the only one dedicated to protecting both children and animals. It’s still a bit early to mark your calendar, but the 2016 Hero Dog Awards will be televised on the Hallmark Channel in late October. Click here to vote for Judge. This category honors ordinary dogs who do extraordinary things. Hooch, a French Mastiff, has badly cropped ears, a broken tail — and no tongue. It was probably removed so he could be a bait dog. Zach Skow, of Marley’s Mutts Dog Rescue in Tehachapi, Calif., adopted Hooch from a shelter where the skittish dog had refused to eat or drink. Skow nursed Hooch back to health by hand-feeding him. Hooch is now a therapy dog with Marley’s Mutts’ Miracle Mutts, helping autistic, abused and special-needs kids realize they can overcome any obstacle. Click here to vote for Hooch. Click here to vote for Hook. Click here to vote for Roo. Click here to vote for Layka. Click here to vote for Kobuk. Click here to vote for Gander. Click here to vote for Mango.